Political parties usually undergo a period of soul searching, after a bruising encounter with the electorate. And the SLPP’s dismal showing in a swathe of bye-elections on the 14th of November, 2015, has triggered such introspection. This was evident last weekend, with news of a leaked Kandeh Kolleh Yumkella (KKY) campaign documents for the presidential election in 2018. The document was significant, because it included the names of a number of SLPP stalwarts, who it would appear, were not merely endorsing KKY as the SLPP flagbearer, but were also lending their support to the campaign to ensure victory at the presidential polls. This news would have caused consternation within PAOPAville. Predictably, Michael Jack Muana poured scorn on KKY, accusing him of arrogance and suggested that some of those listed in the document would be disassociating themselves from the KKY campaign. We waited patiently over the weekend and to date no one has come forward, disassociating himself from the KKY campaign. It seems that the tectonic plates within the SLPP are shifting. Last Friday, KKY arrived in Bo, after the Inspector General of Police, faced with a potential legal challenge and unwanted attention from the international community, backed down and removed the unjustified prohibition that the APC led government had imposed on KKY, under the guise of the emergency provisions which were in place during the Ebola epidemic. It was heartening to see the SLPP Chairman – Chief Somano Kapen demanded that the police provide KKY with protection, because he is an SLPP member and flag bearer aspirant. This call by chief Kapen (Photo) was a direct challenge to the position of Edward Soloku, who was putting up an act of defiance by refusing to allow KKY to visit the SLPP office in Bo. Another character who tried to make a last stand was Jacob Saffa. I understand that he spent two days in Bo trying to discourage and in some cases intimidate people from welcoming KKY. But these unsavory moves only serve to strengthen the resolve of the people of Bo in particular and the south-east in general. KKY’s successful visit to Bo, which included a visit to the site of the new party office, a meeting at the Bo Tennis Club, an early morning run with the youths of Bo last Saturday; and attendance at Mass at the Immaculate Heart Church on Sunday, sent shock waves across PAOPAville. It has demonstrated that the violence threatened by Bio and his thugs can be challenged, and can be described as nothing but hot air. This also indicates that SLPP has started to do some soul searching. The party is waking up to the fact that the divisive message of south-eastern hegemony peddled by Bio, has been rejected by people from the south-east. Kailahun, an SLPP stronghold, rejected this message at the bye-election, as did the people of Freetown. The people of Bo came out over the weekend to support KKY, and this also represents a rejection of the divisive politics peddled by Bio. Party members are gradually coming to the realisation that Bio has failed to show loyalty to the SLPP, by lending his support to candidates who were not selected by the SLPP, and who then chose to stand against official SLPP candidates. He has also been unashamedly opportunistic, meeting with President Koroma and publicly endorsing Koroma’s failed policies as “effective”, while at the same time embarking on a political campaign, in the guise of Ebola sensitisation and doing so, in exchange for cash. They can also see that his assertion that he is the only person who can stand up to Koroma and the APC machine, and if necessary will meet fire with fire, is nothing more than bravado. So KKY’s campaign marches on – “Ain’t no stopping us now, we are on the move…’ So far, KKY has dealt with all that the APC and Bio have thrown at him, and he has done so with magnanimity and in a statesman like manner. Now that these hurdles of membership of the party, visit to Unity House and the SLPP heartland of Bo have been overcome, KKY will now turn his attention to addressing Sierra Leone’s Post Ebola Recovery. Unlike Bio who masqueraded himself across the country in a failed attempt to re-launch his campaign under the guise of Ebola sensitisation, and doing so in a brazen alliance with Ernest Koroma, in a desperate bid for cash to stem potential bankruptcy, KKY will now turn his attention to setting out his vision for Sierra Leone. KKY will also be putting forward clear policies to take Sierra Leone to a better future and to secure sustainable economic recovery. What an interesting article by KKY communication team, followed by interesting comments. Let me address the issue about the SLBC broadcast delivered by the Chairman and Leader Chief Kapen, that KKY was a member of SLPP. I totally agree with our chief by saying. My only problem with this broadcast is that Chief failed to qualify the membership status of KKY either by birth, association, or by registration. Perhaps we should ask Chief to go back to SLBC to clarify this statement for the people of Sierra Leone. What is clear is that it is alleged that KKY had claimed to have registered not in person but through people in several places both here in Sierra Leone and abroad. It is also clear that in all the places he claimed to have registered, he had not provided credible evidence to support his claim. Assuming Chief Kapen meant in his SLBC broadcast that KKY was a member by registration, he still needs to provide material evidence not just through radio broadcast. Chief Somano Kapens’ power does not afford him a final say on this matter by merely going to the media without convincing material evidence. In short therefore, Chief Kapen’s broadcast on this matter is totally irrelevant to say the least. As for Alpha Kamara’s comment, I see nothing of relevance in his preconceived idea that it interests anyone if KKY were to be attacked in Bo. I wonder why people like him should come to this media instead of making meaningful contributions to resolve baseless conjectures. No one benefits from an attack on KKY. When Maada Bio was in Bo, the world saw the support he got from his people. When KKY was there the same world saw exactly the support he got. It is left with the same world to do its mathematics to determine which of the two visits pulled the largest support. But I want to make it clear to Alpha Kamara that the people of Bo and supporters of Maada Bio the world over are decent, well-behaved, respectable, and peace loving citizens of this country. Mohamed Sannoh you are right to mention Charles Margai, but you also failed to mention names such as Fadika and Usu Boie who both joined APC in similar circumstances. I am suggesting that the issue of KKY movement be put on hold until he registers himself as member of the SLPP. 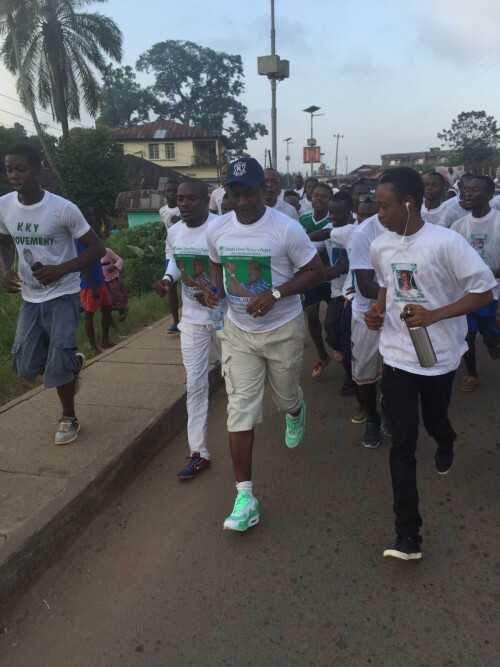 Frankly, as it is, KKY Movement is just a movement formed in Sierra Leone, belonging to no political party. In my view, this movement must not even be discussed with respect to our SLPP. The movement is not a movement within our SLPP nor a breakaway group. At least the people of Bo have shown IG Munu that they are not political extremists who would attack KKY if ever he visits Bo or Southeast. The extremists in Paopa have also been put to shame. If they had any delusion that the people of Bo would pelt KKY with stones if he visits Bo, then they have been disappointed by their own expectations. It is really nice to see you reconcile your own contradictions and by inference come to the realization that there is no conspiracy by mendes and their hegemony or control of the SLPP to prevent Dr. Kandeh Yumkellah from leading the party to compete for the presidency in 2018. As I have said before, there is no monotony of opinion or ideas within the SLPP and the mende people that form the large majority of their support. What we have in common in the southeast is a diversity of opinions and ideas, driven by democratic institutions that put the primacy of the rule of law, and respect for independent thinking on equal levels. Your rant about mende or southeastern hegemony in the SLPP to crown Maada Bio as flag bearer in 2017 has been unfounded, baseless and inconveniently loose. You have confused the extremists within the SLPP whose agenda is either they have Maada Bio or nobody else as a southeastern or mende agenda, and you were wrong then and, empirical evidence in your report about the reception of Dr. Yumkellah in Bo testifies to how wrong you have been. Furthermore,your views about mendes on this forum have been extreme, just like the views of the extremists trying to rig the game in favor of Maada Bio even before the contest begins. Extremism has no place in SLPP politics, and I don’t think you are going to add value to the KKY movement and Dr. Yumkellah’s campaign with the negative view and position you hold about mendes and south easterners. You will therefore do Dr. Yumkellah a huge favor by apologizing to mendes in particular and south easterners in general for them to even contemplate taking you seriously as a member of the media or communication team of the KKY movement in UK and Ireland. I believe that all flag-bearer aspirants are yet at the level of election that is democratically described as the “Primary Level”. Only one winner is expected at this level to move the party to General Election as the Presidential Candidate representing the SLPP. What we do expect from all the aspirants is to accept the flag-bearer election result during the party delegate conference early next year. Those who lose must join the winner and their supporters to take the SLPP to election victory and at this time, we do not expect individual flag-bearers to switch off from the party to form their own party or sell-out to APC as Charles Margai did. Can all SLPP flag-bearer aspirants agree including Kandeh Kolleh Yumkella? If the writer thinks that Kandeh Yumkella will win the SLPP flagbearer elections, I say to him keep dreaming. Realistically, I do not see any scenario under which Yumkella will be the SLPP presidential candidate. For one, the guy is a late comer to the party. Just three years ago he declared that he was neither SLPP nor APC. Is this the candidate that folks should trust with the party’s stewardship? Second, how many people really welcomed Yumkella in Bo to warrant the writer to believe that folks in Bo are for his candidate? These days, “monkey woke babu eat” does not happen. The writer on the basis of his frequent outbursts in this forum seem to have adopted an unhealthy obsession with Maada Bio and Mendes. But Bio and Mendes did not throw Sierra Leone into the cesspit in which she finds herself today. It is the APC and Ernest Koroma that did that. Alan Luke must understand that there are currently about nineteen SLPP flag bearer candidates many of whom are Mendes. Thus, being pro-Maada Bio cannot necessarily be interpreted as a Mende conspiracy against Yumkella. Unfortunately, this is the line that Luke has been propagating here ad infinitum. 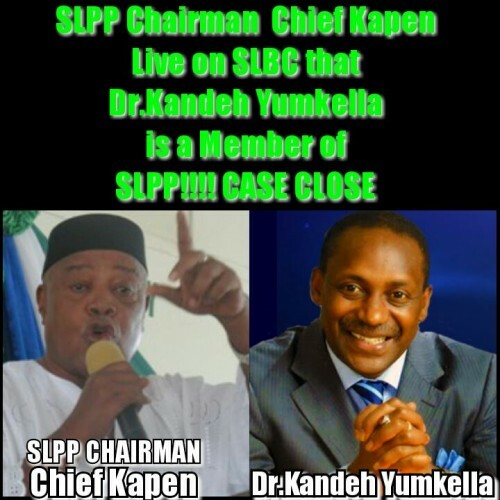 Where was Kandeh Yumkella when SLPP lost two elections in a row? The issue of ‘where was anybody’ when SLPP lost two consecutive elections have no premise. We have better things to look for in choosing our candidate than where was anybody. This is not found anywhere in the SLPP constitution, nor is it a parameter for choosing a candidate. We are considering things like winning ability; who is credible and has no “buts”, and after all has something to point at for his living and not any stone broke person “wae go cam bab we again”. Thank you Alan, you have said it all with nothing to add. Bo District loves KKY and we are going to be with him till we capture state house – period. It was so appreciated to see KKY moving around in Bo. Wow! I Love it. Bio has failed twice. How long are we going to allow him to be our flag bearer? This time I am going to say that wise people are going to analyze 2018 and finally support KKY. He has my support, my husband’s and my son’s.